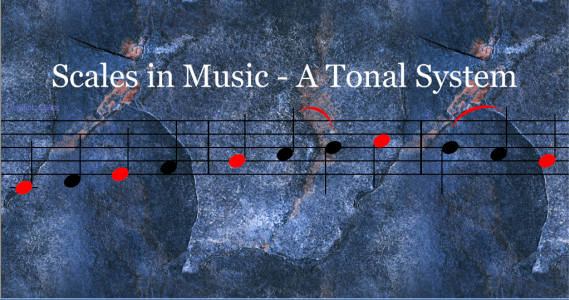 Welcome to The Fermata – Part 17 in the Music theory Section – Level 1 and within the overall article series Scales of Music – A Tonal System. There are three symbols to demonstrate and discuss in this article. The chart below shows all three with a brief explanation followed by presentations for each in more detail. Again, we found it best to use color coding to demonstrate the three symbols. The commonality among them is twofold. All of them can be placed above or below the staff. Each performs a specific function however in principal that function is the same. Each of them has a dot between the “legs” of their symbols main feature. The Fermata extends the duration of the note directly underneath the symbol only. In the chart above the last note in black is the standard quarter note used in music notation. Its duration remains unchanged. Second Fermata Application – When two or more voices are involved in a single line of music, the fermata can also be placed below the staff as shown in the following chart. This chart shows a more advanced application however it was selected to be placed in this article due to its applicability to the overall concepts included in this document. Note: What multiple voices are is a rather easy concept although it might be a bit confusing to someone completely new to music. If a single instrument is playing more than one line of music or multiple voices on a single staff the notes are placed as shown in the chart above. 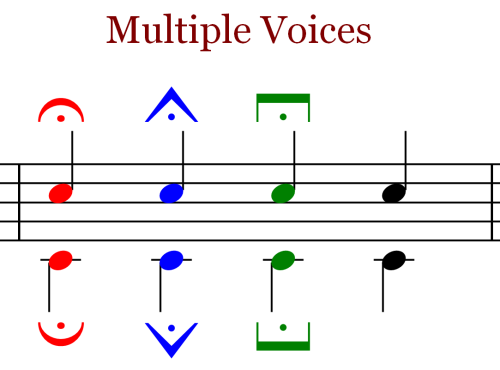 Each voice is separate although the multiple voices are played or performed by the same instrument. An example would be a single guitar staff demonstrating the melody line and the bass line on a single staff of music. The melody line is one voice and the bass line is the second voice. The only difference in the fermata symbols for two or more voices is the fermata is inverted or placed upside down below the applicable note. The notes, the fermata and other markings all behave exactly the same way as those used for single line of music. The (Regular) Fermata – The symbol for the regular Fermata is an arch with a thicker line on its highest reach and tapering off on each leg of the arch. Within the white space beneath the arch and directly at the midpoint of the main arch feature is placed a single dot. The (short) Fermata – The symbol for the short Fermata is an upside “V” which has a wider distance between the two legs of the “V” than a standard letter “V” does. Again, a single dot is placed below the apex or top part of the inverted “V” and in the white space between the “Legs” of the main feature. 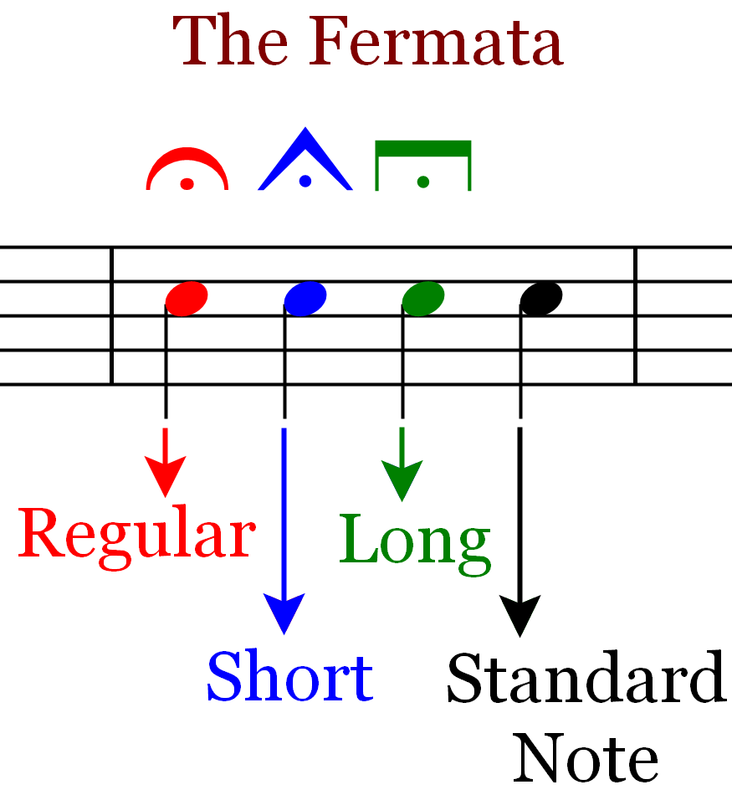 The (long) Fermata – The long Fermata symbol is comprised of three main parts; a top thick and short line, a left and right thin vertical line on either end of the thick line and a single dot placed directly under the midpoint of the thick line and midway between the two vertical “legs”. Function – The primary function of the Fermata is to extend the duration of the applicable note or rest in a musical score longer than the note indicates by its symbol. 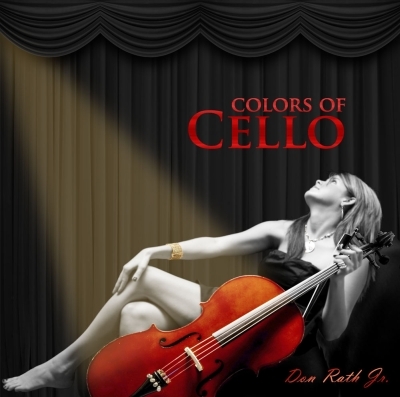 It can be placed on any note or on any rest anywhere within a musical score. In essence, the fermata steals time. It does not alter the notation of the score, whether by changing the time signature or by adding notes or rests to the measure. In other words no additional notes or rests are placed on the staff to compensate for the added duration to them as caused by the use of the fermata. The effect is a sustaining or holding of the note or rest longer than the applicable symbol suggests without the fermata mark. Placement – The Fermata is always placed directly above or directly below a specific note or rest and it is always placed above the top line or the bottom line of the 5-line musical staff. Remember, if the fermata is placed below the staff the entire symbol is inverted or placed upside down directly below the applicable note or rest. The following three examples provide both the notation and the audio mp3 clip example for each of the fermata symbols. Please listen carefully and if necessary repeatedly to each example as the fermata does not extend the duration for a long period of time. The extended duration will be part of the explanation below each chart. The Regular Fermata Example is shown first. Please take your time and pay close attention to the mp3 clip until you can hear the effect of the fermata. 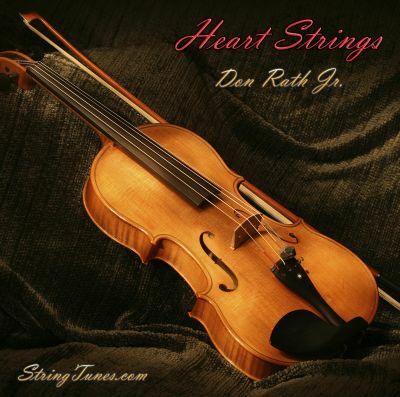 Just because many people are not aware of subtle variations in the length of short sounds it is important to play these three samples repeatedly until you can hear the differences between them. 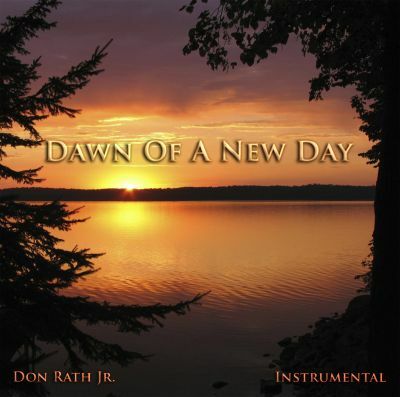 If you are having difficulty, try starting with the long fermata sample first. It is by far easier to hear than the short fermata. If you can hear them then great! The fermata is used to extend the duration of the note or rest without altering the time signature, flow of the beats or adding additional notes or rest within a measure. The fermata is placed either above or below the specific note or rest which you want to be held. There are three primary symbols for the fermata. The first is the regular fermata, the second is a short fermata and the third is a long fermata. Each has its own symbol and each symbol is reviewed in this article. This concludes the Fermata – Music Theory Section – Level 1 – Part 17 article about the Fermata and its symbols. We hope that you have gain insight into the fermata its symbols and the differences in the duration between them. Up next is a study of Ties and Slurs and their effect on notes in a musical composition. The full title of the next article is Ties and Slurs – Music Theory Section – Level 1 – Part 18. Please proceed to Ties and Slurs – Music Theory Section – Level 1 – Part 18. Note: All graphics were made using Sibelius Music Software from Avid Technologies. The sound samples were created using Wavelab from Steinberg.